A Shower Door is Not Just a Shower Door Anymore…. 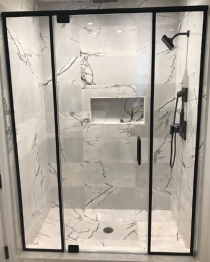 Over the past decade, advances in shower door hardware, glass types, and configurations have given homewowners’ the ability to achieve their aesthetic demands along with the desired function. 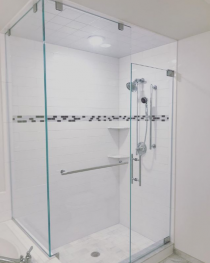 Here, at Suburban Glass, we receive quote requests through our website and via email daily asking, “How much for a frameless 5’ shower?” A request like this is the same as emailing a realtor asking, “How much does a house cost?” Prices can vary drastically. Long gone are the days of providing quotes on minimal information. 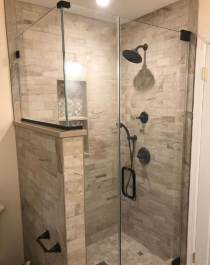 It is impossible to accurately quote a shower enclosure that will be cost effective, functional, and meet a homeowners’ demands without fully understanding the customer’s expectations, the décor of the bathroom, and room layout. Shower door configurations, hardware finishes, and glass types should be considered at the beginning of every project. The location of toilets, vanities, shower heads, and plumbing can make or break the overall end user’s experience. Sliding enclosures save space and allow for easier access to enter the shower and operation of the shower controls. Sliding shower doors have evolved the most. Everyone remembers the old style bypassing framed doors with the bottom track that was impossible to clean; those types of the enclosures are in the distant past. Easy clean bottom tracks have replaced the old messy bottom ‘E’ tracks on the traditional bypass sliding doors. Barn style single and double sliding doors have now become an everyday installation. Swing doors have come full circle. 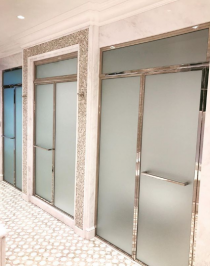 Originally, only framed enclosures were available, once frameless enclosures entered the market place, they ruled the shower door world for the three decades. Recently, in the ever evolving world of interior design, framed grid shower door have become the centerpiece of many bathrooms. What configuration shower door is right for your home…that depends on you and your bathroom. For more information on how to prepare your opening take a look at the “Shower Door Basics” section of our website. Shower door hardware is available in a number of different finishes. Chrome and Brushed Nickel being the most popular and provide the most flexibility. Polished Nickel, Oil Rubbed Bronze, Matte Black, and Satin Brass are the next most requested finishes. These more “exotic” finishes are not available in all types of hardware, and it is best to keep this in mind when shopping for your bathroom fixtures. These less standard finishes may limit your options when it comes to your shower enclosure. Feel free to give us a call to discuss things like this while you are in the planning stages of construction. Glass options and glass thickness present a number of different options. Consider this, we offer 8 different types of clear! Low Iron Glass and Shower Guard Glass have become extremely popular. They help keep glass looking new and brighten up any room. For more in depth information on glass types visit our “Shower Door Basics” section of our website.